This article is about the future tallest buildings according to the Council on Tall Buildings and Urban Habitat. For list of all visionary tall buildings, see List of visionary tall buildings and structures. This list of future tallest buildings ranks the tallest buildings in the world which are planned or currently under construction. The Burj Khalifa with a roof height of 828 m (2,717 ft) is currently the world's tallest building. This is a list of the future tallest buildings in the world and does not include buildings below 442m or 1,450ft or other structures such as towers. Heights are indicated by structural height, which includes architectural elements, but not communications spires or antennas. All height values and the definitions of proposed and under construction are according to the Council on Tall Buildings and Urban Habitat. Only proposed and under construction buildings are included here. All vision buildings are listed at List of visionary tall buildings and structures. Dubai will have four of the world's future tallest 50 buildings, including the world's current tallest. New York City will have five of the world's future tallest 50 buildings, with two of these currently under construction. Building is the tallest in the world today. Building is currently under construction. 1 Jeddah Tower Jeddah Saudi Arabia 1,008 m 3,307 ft 168 2020 Will become the tallest building in the world. Under construction. 2 Burj Mubarak al-Kabir Kuwait Kuwait 1,001 m 3,284 ft 234 2030 Will become the tallest building in Kuwait. 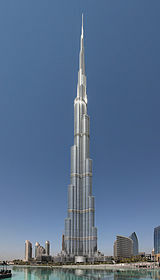 3 Burj Khalifa Dubai UAE 828 m 2,717 ft 163 2010 Currently the world's tallest man-made structure. 4 Suzhou Zhongnan Center Suzhou China 729 m 2,408 ft 137 ? Will become the tallest building in China. 6 PNB118 Kuala Lumpur Malaysia 644 m 2,113 ft 118 2021 Also known as "Merdeka PNB118". 7 Signature Tower Jakarta Jakarta Indonesia 638 m 2,093 ft 113 2021 Will become the tallest building in Indonesia. 9 Changchun World Trade Center Changchun China 631 m 2,070 ft 126 ? 10 Al-Aman World Capital Center Colombo Sri Lanka 625 m 2,051 ft 117 2022 Will become the tallest building in Sri Lanka. 11 Rama IX Super Tower Bangkok Thailand 615 m 2,018 ft 126 2021 Will become the tallest building in Thailand. 13 Tradewinds Square Tower A Kuala Lumpur Malaysia 608 m 1995 ft 150 2025 Will become the tallest building in Malaysia and Southeast Asia. 19 Hyundai Global Business Center Seoul South Korea 569 m 1,867 ft 105 2022 Will become the tallest building in South Korea. 21 Thai Boon Roong Twin Trade Center Phnom Penh Cambodia 560 m 1,837 ft 133 2021 Will become the tallest building(s) in Cambodia and the tallest twin towers in the world. 22 Greenland Centre Nanjing Nanjing China 560 m 1,837 ft 107 ? 23 Al Noor Tower Casablanca Morocco 540 m 1,772 ft 114 ? Will become the tallest building in Morocco and Africa. 26 Zhongguo Zun Beijing China 528 m 1,732 ft 108 2018 Also known as "China Zun". 27 Guizhou Culture Plaza Tower Guiyang China 521 m 1,709 ft 109 ? 30 Jinan IFC Landmark Tower Jinan China 518 m 1,699 ft 135 ? 33 Pentominium Dubai UAE 516 m 1,693 ft 122 ? 35 Greenland Centre Xian Xian China 501 m 1,644 ft ? ? 37 The Exchange 106 Kuala Lumpur Malaysia 492 m 1,614 ft 106 2018 Formerly known as "TRX Signature Tower". 39 ASE Center Chongqing China 486 m 1,594 ft 88 ? 40 Jumeirah Business Bay Tower Dubai UAE 485 m 1,591 ft 100 ? 41 Houjie International Home Furniture Center Building Dongguan China 480 m 1,575 ft 102 ? 42 Kunshan Centre Suzhou China 480 m 1,575 ft ? ? 44 Landmark 81 Ho Chi Minh City Vietnam 461 m 1,513 ft 81 2018 Will become the tallest building in Vietnam. Listed here are the cities of future tallest buildings in the world. The following table is a list of the future tallest buildings by each continent. Buildings included are either under construction, on hold or proposed. ^ a b "100 Tallest Completed Buildings in the World by Height to Architectural Top". The Skyscraper Center. The Skyscraper Center. Retrieved 24 August 2016. ^ ctbuh. "CTBUH Criteria for Defining and Measuring Tall Buildings". www.ctbuh.org. Retrieved 2017-04-21. ^ "DubaiOne". Skyscraper Centre. Retrieved 25 August 2016. ^ "H700 Shenzhen Tower". Skyscraper Center. Retrieved 25 August 2016. ^ "Nexus Tower". Skyscraper Center. Retrieved 26 August 2016. ^ "Rose Rock International Finance Center". Skyscraper Center. Retrieved 26 August 2016. ^ "Hyundai Global Business Center". Skyscraper Center. Retrieved 26 August 2016. ^ "Orion Towers (South Tower) - The Skyscraper Center". www.skyscrapercenter.com. Retrieved 2018-03-22. ^ "FORZA Tower -The Skyscraper Center". www.skyscrapercenter.com. Retrieved 2018-10-16. This page was last edited on 14 April 2019, at 14:39 (UTC).